Highly Unusual Light Pillars over Blair Nebraska - were predicted ? 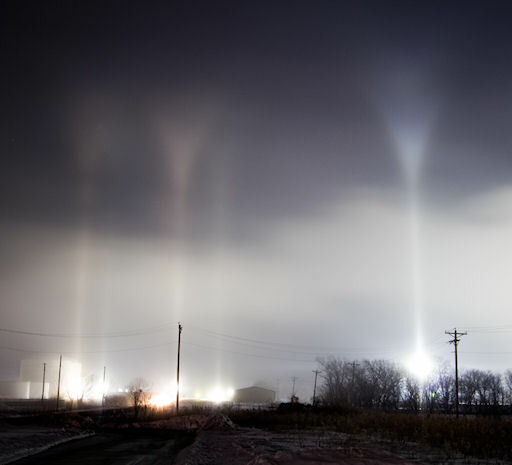 These light pillars are not just rare, they are exceptional!" declares atmospheric optics expert Les Cowley. "Ordinary pillars are produced by plate-shaped ice crystals roughly half way between you and the light source. These are different. Their rarely seen flared tops show that they were made by column-shaped crystals drifting slowly downwards and aligned horizontal by air resistance." An amazing sight,and so clear too! I pondered on this,for a little bit!....? An honest lady,in "her belief!" October 14th. Prediction,and took the can for it,so to speak! Hence; her highly controversial Psychic ability,with every one! But,you know what?....I think she deserves a second chance!? just because, we can "all" get it rong sometime,and not all from our own making!...She was let down!...Duped!..AND..she did apologize! I think she ment well! but it didn't came pass!....? I see these pillars very often during the winter when there is snow mist. Is there really room on THIS site for the Blossom Goodchild's of this world?? communication by the ETs,and we've all heard about this! then there must be room,for the "Goodchilds" of this world,in due consideration of their Psychic ability!...? if they could only get it right!? must of been the same light that reflected off the swamp gas! amazing!